The Hulē‘ia River is the largest stream and estuary of the Nawiliwili Bay Watershed. Its waters are joined by those of the Pū‘ali Stream in front of the Kaiola Canoe Club hale. Kaiola Canoe Club paddlers are therefore among the most frequent recreational users of the river. Virtually every day of the year, whether paddling out to the ocean or going on a flat water training run, the Hulē‘ia is our primary waterway. We use the Hulē‘ia River to learn and improve in the sport of competitive outrigger canoe paddling. It is where our Na Ōpio paddlers first learn to stroke, pull together, steer, and race the canoe. It is where our novice paddlers first learn the meaning of hoe, huki, huli, une, kahi, and lawa. The river is where our coaches love to drill their crews on technique, timing and speed. Up and down the river, out to the harbor and bay and then up the river again – we have paddled this course over and over, building strength, building endurance. The Hulē‘ia River is our source of health and well being. Exercising on the river certainly makes us healthy. But there is a broader sense in which the river provides for our well being. Our canoe club is named Kaiola (kai+ola) after the ocean’s life sustaining powers. As the waters (wai) of the Hulē‘ia River flow into the ocean (kai), they also contribute to the sustaining of ola, of health and life. They do this by connecting to the ocean everything touched and nourished by water in the Nawiliwili Bay Watershed – clouds, mountains, plains and valleys, plants, animals and humans. All are part of a natural ecosystem that is interconnected and kept healthy by the flowing of water. The Hawaiian term for this ecosystem is ainakumuwai. Water flows from the Ha‘upu Mountain Range to the Hulē‘ia River and then to the sea. In former times, the Hulē‘ia River literally sustained the people living along its banks. Taro fields (kalo lo‘i) and fishponds (loko‘ia) lined the river. Higher up were sweet potato (‘uala) banana (mai‘a), breadfruit (‘ulu) and other food plants. The water was free flowing and clear, and o‘opu, opai, opihi, striped mullet (‘ama‘ama), milkfish (awa) and samoan crabs were abundant. The waters of the river provided not only food, but other necessities of life by nourishing such trees and plants as paper mulberry (wauke) for kapa, gourd (ipu) for containers and musical instruments, hala for mats, wilwili for canoe ama, etc. Today we do not depend on the Hulē‘ia in the same way as the Hawaiians did in the past. We use the river mainly for recreation and otherwise busy ourselves with the stuff of modern life. After paddling practice we are eager to shower off the river water, jump into our trucks and go home for a few beers and a nice dinner of store-bought food. This may be good, because the river is no longer what it once was. Fumes from our neighbor in the Nawailiwili Commercial Harbor flow up the Hulē‘ia. Sugar plantations, feral animals, housing developments, shopping centers, busy highways, cruise ships, golf courses, GMO seed corn, etc., etc. have all taken their toll on our island environment and on the Hulē‘ia River. So has red mangrove. The river is now slow moving, often brown with silt, sometimes pretty bad smelling. And who knows what invisible chemicals have washed off the land into the river. The river’s basic ainakumuwai role is unchanged, but its health and life giving powers are now diminished. 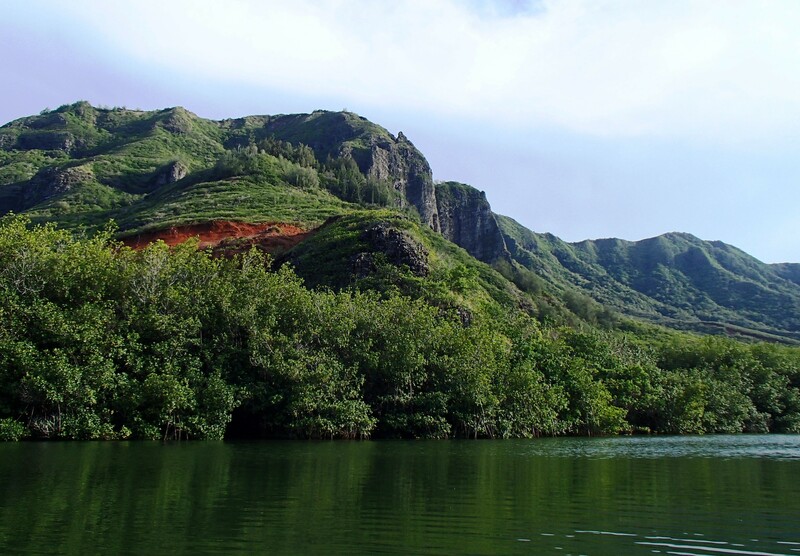 The Kaiola Canoe Club has a responsibility, kuleana, to care for the environment in which it operates. We cannot reverse all the negative effects of human development on the natural environment. But we can make a start at restoring the some of the life sustaining powers of the Hulē‘ia River by helping it to flow more freely and to connect more naturally with surrounding wetlands. We can do this by eradicating the alien red mangrove that has completely overgrown the banks of the river and invaded adjoining riparian areas of the Nawiliwili Bay Watershed. So that is the objective of our Mālama Hulē‘ia project.